Sign up for my (infrequent) Newsletter and get a sneak peek at Chapter 1. Later this year subscribers will get an exclusive short story – A Knight’s Tale (Passages) – featuring a young Sir Stephan l’Aigle. King Richard has their loyalty. The French would have their lives. And John, the king’s brother, will never forget how they betrayed him. The kidnapping of the king’s former sister-in-law sets off a chain of events that entangle the knights Henry de Grey and Stephan l’Aigle in politics and intrigue, treason . . . and murder. 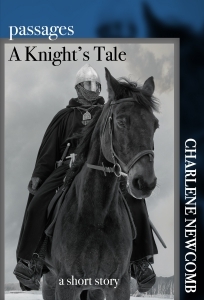 With Swords of the King, Charlene Newcomb follows up her award-winning novel For King and Country (Battle Scars II) amidst the turbulent final years of the reign of Richard I of England, the Lionheart. This epic adventure furthers an original Robin Hood origins story and will captivate fans of historical fiction and anyone who likes a little romance—forbidden romance—with their history. Available for pre-order (ebook) on Amazon.